Bob's son is messing about on his bike. Scott is fed up of working for free at the Coffee Shop to pay off his debt. Julie gives Phil his ring back and tells him it's over - he should make a go of things with Loretta. Bob's son rides out in front of Jim's car. 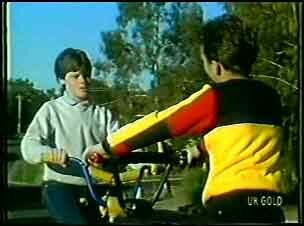 Jim brakes but the boy falls off his bike and on to the ground. 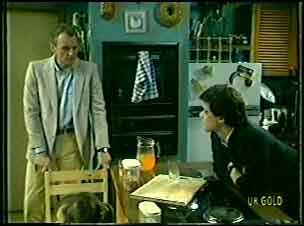 Bob's son is OK. Jim tries to explain that he nearly got himself killed, but the boy is unrepentant and runs off. The phone rings and Paul answers it to Mrs Armitage. Helen shakes her head violently to tell Paul she's not there because she's cooking(!) 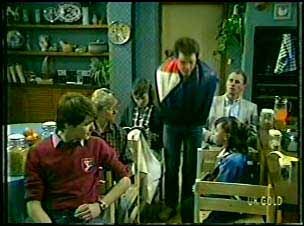 But Mrs Armitage is ringing to say that Jim nearly knocked Bernie Sutton off his bike. Just then Jim comes in and confirms the accident. He says he'll go round and see his parents later. Lucy says that Bernie Sutton is a nerd(!) Paul says that they never had any trouble on their bikes because Jim lectured them so hard about it! The bell rings and Bob answers it to Jim. 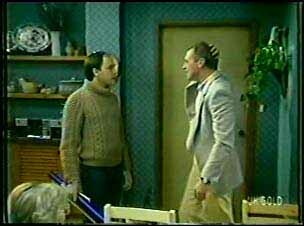 Jim offers to talk to Bernie about the rules of the road. Bob doesn't agree - he says the accident was Jim's fault. Jim says he blames Bob for not teaching Bernie the rules of the road. Jim can't understand why Bob won't instruct Bernie properly. Bob says it's safer for Bernie to drive on the right - towards the oncoming traffic. Jim is rather takenaback and tells Bob to get some books on road safety. Then he leaves. Julie comes round the back with a letter and knocks on the back door. She's still upset. When Des answers the door, she gives him the letter and asks him to take it in to the bank - it's her resignation. 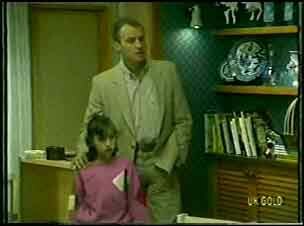 She tells Des that she and Phil have parted. Des says Julie should just get a transfer to another branch, but Julie says the gossip would be just as bad. Her pride's all she's got left. Outside the bank, Marilyn is gossiping to her mate about Julie. Des sees Phil getting out of his car. Phil says that he's leaving the bank today - he's just been to Head Office. Des tells Phil that Julie is resigning too - Phil is very shocked. He tells Des that it wasn't a sordid little affair - and they both still love each other. Julie is reading a magazine. Helen advises her to start thinking about another job. Just then Des comes round to see Julie. He tells her that Phil has resigned from the bank - they'll have George Webster as a manager instead. Des didn't hand in Julie's resignation. Des tells her that Phil left for Julie's sake and she should go back to work. Julie says she can't face the girls at the bank. Helen says she hasn't done anything wrong and she should have enough courage to ride out the gossip. Max is talking to Marilyn about a cheque that's gone missing. He says that computers could make mistakes and goes off into a spiel about the limitation of artificial intelligence(!) Just then, Julie and Des come in. Marilyn asks her with relief to take over with Max - he's blinding her with science! They laugh together. Max calls out to Maria, but there doesn't appear to be anyone home. He picks up a photo album and looks at picture of him and the boys and Maria in it. He goes to take one of the photos, but just then Maria comes in from the supermarket. He shows her a trophy he's found in a second-hand shop. It's one of Shane's trophies and he's bought it back. They chat quite civilly and look at the photo album. They admit that they did have some happy times. Max says he won't tell Shane about buying this latest trophy - he was mad enough about the first one. He never talks about diving now. Maria says she's been thinking - it's mad for him and Shane to be living in the bedsit alone. If he wants to come back, maybe Maria could go and stay with Anna. But Max says that the Ramsay house is Maria's home and it's hers for as long as she wants it. It's the end of the working day and Julie thanks Des for everything. Lucy comes in and says she's never talking to Bernie Sutton again. He and another boy are saying that Jim knocked Bernie over because he was drunk and is blaming Bernie to cover up(!) Paul says that Lucy knows that their dad doesn't drink and drive. Helen tells Lucy not to tell Jim and fuel the flames of the argument. Bernie is playing football in the living room and his mother tells him off. Jim comes round with some road safety books. 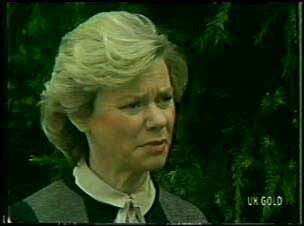 Mrs Sutton rolls her eyes. Just then, Bob Sutton comes round and shouts at Jim about the road safety books. He says Jim should keep his nose out. Jim says that he's tired of parents not explaining to kids about road safety. Bob storms out. Paul says that maybe Jim does come on a bit strong about road safety. Jim says that Paul's job depends on him giving appropriate safety lectures - he can't see the difference. Bernie Sutton and another boy are having a race - on the wrong side of the road, naturally! Paul and Jim are discussing the garden. Helen and Lucy comes back from the corner shop and tell Jim there's been an accident. 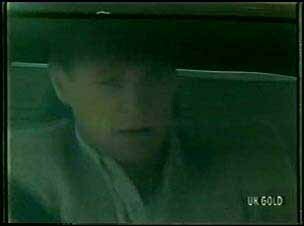 Bernie Sutton was riding on the main road. He's been killed.